Product Details-Available in four sizes- Petite, Small, Medium and Large.afer for teeth than real antlers,Multiple textures help clean teeth during chew, Will not splinter or split, Materials made in the USA, Helps maintain and improve dental health. 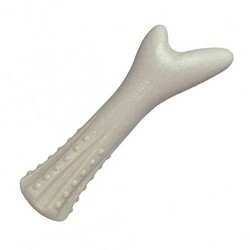 Product Information-Satisfy your pups wild instincts with Deerhorn by Petstages. Made with real antler material. Deerhorn has a natural taste and smell your dog will love, but is safer than actual antlers. Your pooch will spend hours safely chewing and chomping away on this durable, tough toy. Keep your best friend safely occupied for hours with Deerhorn by Petstages.